As we discussed last week on the pod, so many churches kill off great songs, mainly by flogging them to death. We take a perfectly good song and ruin it, and then throw it on the scrap heap of worship life. There are so many really good songs that we have simply discarded because they were flogged to death by worship leaders. Songs like Shout to the Lord and Shine Jesus Shine, which were good in their day, have been more or less abandoned. Even if a song was once a great song, many people are just over them today. So is there any hope for these songs? Picture this... we take one of these once loved tunes and we give it a different style, a different feel, perhaps we start it a fresh and new way, or make an acapella version of it. There are loads of ways you can breath new life into a once great song, and that's exactly what the guys discuss in this pod. They will share new, innovative ideas that will allow you, and your congregation, to rediscover anew the beauty and wonder of songs that were once loved but have fallen into disrepute. Simple ideas and technique could make all of the difference as you rediscover the awesomeness of some songs you might have thought gone forever! In this podcast, Darin and Erick take 12 minutes to discuss how you can resurrect those seemingly destroyed songs. This is a great podcast to head into Easter with... The theme of resurrection! 1 But sadly, many do kill a great song! Let's face it, there are loads of wonderful songs in our churches, from the hymns of old right through to the latest hits, but we don't always do them justice when we play and sing them in our worship. We might sing of our crucified Lord, but sometimes we crucify the song in the arrangement and feel that we give it! So, in this slightly tongue in cheek and funny podcast, we are going to look at the top five ways you can kill a perfectly decent song, and we will do it all in just 12 minutes. That's right, we have actually sat down and thought about how we could kill a great song, ways in which we can make this song, however great it is, into the one that makes our congregation roll their eyes when we start it! And if you do what we suggest, you should be able to take any perfectly good and wonderful song and ruin it for your congregation. Whether it is overplaying it to death, pitching it too high or some other classic mistake, this is not only a lot of fun but it is a great podcast with practical applications for many of us worship leaders. The hope, of course, is that you will then reverse engineer this and not kill great songs... So we are not advocating actually doing the things we suggest, but rather that you learn how not to do these things... so we can keep great songs as what they are... great songs! And don't forget, you can learn all about how to arrange songs to make them great by joining our Worship Leader Academy. It includes loads of fun, practical and easy to apply tips that will take your worship leading to a higher level, in just a few short months. Join the academy, and you will never kill a great song again! So, what is your worship style? 1 Is it something from another generation, or are you trying to emulate some other worship leader? Is it a style unique to you and your church, or are you trying to sound like your favourite band? The way you present your worship plays a key part in how comfortable people are entering into a closer and deeper fellowship with the Lord. The style of your worship is often dictated by the style of your congregation. Imagine leading worship with just an organ at a youth meeting, or on the flip side, imagine leading worship at a senior's meeting with a heavy metal band! The thing is, as the worship leader, you have a unique opportunity to develop your own style of worship, the kind of music that attracts people and opens their hearts to the gospel, and allows them to go deeper with God. However, many worship leaders simply try and transport what some famous worship leader on YouTube is doing into their local church, and this can lead to really discouraging results. We should not be just trying to imitate someone else, but be seeking the Lord for our own, unique style of worship that not only suits us, but more importantly suits our congregation and church leadership. This podcast asks the big questions about the way you lead your team and your congregation, and it will be invaluable for those seeking a unique and beautiful way of leading worship. As you listen open your heart and hear from the Lord as to the best way you can establish a style of music and presentation that captures the hearts of your people, and allows a more intimate level of worship in your church. So what is your worship style? Listen to this week's podcast and discover yours now...This great podcast deals with ideas to start a song service in your church. Finishing a Church Service Well Can Transform your Worship Leading Ministry! However, this is one of the most neglected areas of our ministry. We do so much preparation for the worship time, for the main areas of worship in the situation, that we often completely neglect what should be the most important area of the church service. Think about it... how long do you take to prepare for your ministry on a Sunday? Consider practice, your personal quiet times, rehearsals before the service, etc. Now, honestly, how long do you take to prepare for the end of the service. Are you finishing a church service with incredible anointing and sensitivity, or is it something like, "OK, we're done, let's get some coffee!" From a pastor's point of view, the end of the service is often the most important part of the church service. If the pastor has preached their heart out and challenged the people, there may be a time of reflection or even a response to the message, and this needs to be carefully and prayerfully woven around your worship ministry. Your music, your ministry is an integral part of the service climax. People have heard the Word of God, they are thinking it through, perhaps souls are hanging in the balance, and you have the opportunity to be part of something great, something eternal. Finishing a church service is not simply about wrapping things up in a professional way, it is a chance for you to leave a deposit in people's lives, and to be a part of potentially an eternal event in the lives of those listening. For this reason, we need to be careful about what songs or songs we sing, and how we sing it. We need to consider our volume, especially if people at the front are being prayed for. We also have to consider what note we will be sending people forth on. Do we pull the atmosphere into a gentle and thoughtful end, or do we have people leaving on a high, praising and honouring God as they worship? Make the end of your service extra special by listening to this 12 minute podcast...Ego or service, that is the choice all of us make at some time as worship leaders. 1 All of us as musicians and singers grapple with our egos, and if we are honest, most of us want some kind of recognition for our gift. When we lead worship we want to see our people worshipping the Lord freely and in power, but to do this we must choose the songs that work. And how do you know which ones will work? Well, that's the content in today's very important 12 Minutes for Worship Leaders podcast. Many worship leaders feel confused and even stressed when it comes to selecting the songs for the service they are leading. We do not want to be too progressive, but then we do not want to be seen as old fashioned or regressive either. We might love certain songs, but does that mean that everyone else in the church does too? When leading it is tempting to choose songs that we like, that perhaps we feel comfortable with, but if your congregation doesn't know them or doesn't like them, you have a problem on your hands! One of the most common and critical errors I see worship leaders make is choosing the wrong songs, and especially choosing worship songs based on what they like, or what the band likes, or what has just been played at the latest conference you attended. If you do choose your songs unwisely, then there is a massive chance that your worship leading will fall flat. This is why we have a worship academy, to teach these simple but effective principles which will be the difference between leading a few songs and leading your entire congregation into the very presence of God. Trust me, the stakes are high for this one! In this 12 minute for Worship Leaders Pod, we look at how you can choose songs that work every time, so every worship leader should listen to this...Multiple Church Services can be incredibly taxing, but they can also create huge blessings for you, your worship team and the whole congregation. Multiple Church Services Should Mean Multiple Blessings! 1 Most often we turn to multiple church services because we cannot fit people into a single service, or because we have people who want something different from the service, and we feel it is impossible to join the different needs and cater for them in the single service. In this week's 12 minutes pod, Erick and Darin discuss the various reasons for going to 2 or more services, the pitfalls, the fallout and the blessings that you might see along the way. And trust me, there are blessings if we do this right, but there can be curses if we do it wrong! So whether your church is growing so well that you need to change the way you do church on a Sunday, or whether you have two fighting factions each of whom demands a church service to their own liking, there are potential blessings and curses along the road. The guys discuss the recent changes they have experienced in church, and how we can see those become a blessing rather than a curse for your people. Learning how to resurrect a great song is a skill we should all have in worship leading. As we discussed last week on the pod, so many churches kill off great songs, mainly by flogging them to death. We take a perfectly good song and ruin it, and then throw it on the scrap heap of worship life. There are so many really good songs that we have simply discarded because they were flogged to death by worship leaders. Songs like Shout to the Lord and Shine Jesus Shine, which were good in their day, have been more or less abandoned. Even if a song was once a great song, many people are just over them today. So is there any hope for these songs? Picture this… we take one of these once loved tunes and we give it a different style, a different feel, perhaps we start it a fresh and new way, or make an acapella version of it. There are loads of ways you can breath new life into a once great song, and that’s exactly what the guys discuss in this pod. They will share new, innovative ideas that will allow you, and your congregation, to rediscover anew the beauty and wonder of songs that were once loved but have fallen into disrepute. Simple ideas and technique could make all of the difference as you rediscover the awesomeness of some songs you might have thought gone forever! In this podcast, Darin and Erick take 12 minutes to discuss how you can resurrect those seemingly destroyed songs. This is a great podcast to head into Easter with… The theme of resurrection! But sadly, many do kill a great song! Let’s face it, there are loads of wonderful songs in our churches, from the hymns of old right through to the latest hits, but we don’t always do them justice when we play and sing them in our worship. We might sing of our crucified Lord, but sometimes we crucify the song in the arrangement and feel that we give it! So, in this slightly tongue in cheek and funny podcast, we are going to look at the top five ways you can kill a perfectly decent song, and we will do it all in just 12 minutes. That’s right, we have actually sat down and thought about how we could kill a great song, ways in which we can make this song, however great it is, into the one that makes our congregation roll their eyes when we start it! And if you do what we suggest, you should be able to take any perfectly good and wonderful song and ruin it for your congregation. Whether it is overplaying it to death, pitching it too high or some other classic mistake, this is not only a lot of fun but it is a great podcast with practical applications for many of us worship leaders. The hope, of course, is that you will then reverse engineer this and not kill great songs… So we are not advocating actually doing the things we suggest, but rather that you learn how not to do these things… so we can keep great songs as what they are… great songs! And don’t forget, you can learn all about how to arrange songs to make them great by joining our Worship Leader Academy. It includes loads of fun, practical and easy to apply tips that will take your worship leading to a higher level, in just a few short months. Join the academy, and you will never kill a great song again! Is it something from another generation, or are you trying to emulate some other worship leader? Is it a style unique to you and your church, or are you trying to sound like your favourite band? The way you present your worship plays a key part in how comfortable people are entering into a closer and deeper fellowship with the Lord. The style of your worship is often dictated by the style of your congregation. Imagine leading worship with just an organ at a youth meeting, or on the flip side, imagine leading worship at a senior’s meeting with a heavy metal band! The thing is, as the worship leader, you have a unique opportunity to develop your own style of worship, the kind of music that attracts people and opens their hearts to the gospel, and allows them to go deeper with God. However, many worship leaders simply try and transport what some famous worship leader on YouTube is doing into their local church, and this can lead to really discouraging results. We should not be just trying to imitate someone else, but be seeking the Lord for our own, unique style of worship that not only suits us, but more importantly suits our congregation and church leadership. This podcast asks the big questions about the way you lead your team and your congregation, and it will be invaluable for those seeking a unique and beautiful way of leading worship. As you listen open your heart and hear from the Lord as to the best way you can establish a style of music and presentation that captures the hearts of your people, and allows a more intimate level of worship in your church. This great podcast deals with ideas to start a song service in your church. The start of the song service is always a key time, with people walking into the room, with people still talking and chatting to each other, and with a few ready to worship. Fist choice… do you start on time, or do you wait until there are people in the room? In my culture, we start on time! This means when you come to kick off the service, the room might be 1/5 full, and the hearts of people are distracted, catching up with friend, still grappling with the fight the had on the way to church, or a hundred other distractions. How can you capture the attention and the hearts of your listeners, and turn them from the cares of the day and life’s many distractions towards worshipping the Lord? The answer to this important and extremely practical question is what this podcast is about. Darin and Erick have come up with 5 different and valid ways of starting a song service (of course there are many others too! ), and these are so practical you can try them out starting this week. From the long, atmospheric introduction to the punchy, high energy approach, these ideas will change the way you start your entire service and set the scene for worship in a way you may have never experienced. This is a great 12 minutes that you can take and apply immediately in your worship ministry… great ideas to start a song. The beginning of the song is such an important part of your worship leading because if you mess this up, you can lose people’s confidence even before you start. And let’s face it… we spend so much time rehearsing the body of the song, that often we forget to concentrate on the incredibly important start and finish to the number! We also overlook the fact that the beginning of a song also provides an incredible opportunity to try new and creative things. Just because Hillsong did it a certain way on their last album, does not mean that that is theirs is the only ideas to start a song. In fact, as you launch into a song, you can give every song your own flavour, and surprise people (in a good way, not a “Man, that was horrible” way). There’s the slow and atmospheric approach, or the big beat approach, or even the full 4 part harmony vocal idea… all of these are valid, and trust me, creating new and stunning arrangements as the song begins is one of the great joys of leading worship in church. So have a listen and be inspired to make each and every start if a worship songs something special, anointed and attractive to your listeners! Finishing a church service is an important part of being a successful worship leader. However, this is one of the most neglected areas of our ministry. We do so much preparation for the worship time, for the main areas of worship in the situation, that we often completely neglect what should be the most important area of the church service. From a pastor’s point of view, the end of the service is often the most important part of the church service. If the pastor has preached their heart out and challenged the people, there may be a time of reflection or even a response to the message, and this needs to be carefully and prayerfully woven around your worship ministry. Your music, your ministry is an integral part of the service climax. People have heard the Word of God, they are thinking it through, perhaps souls are hanging in the balance, and you have the opportunity to be part of something great, something eternal. Finishing a church service is not simply about wrapping things up in a professional way, it is a chance for you to leave a deposit in people’s lives, and to be a part of potentially an eternal event in the lives of those listening. For this reason, we need to be careful about what songs or songs we sing, and how we sing it. We need to consider our volume, especially if people at the front are being prayed for. We also have to consider what note we will be sending people forth on. Do we pull the atmosphere into a gentle and thoughtful end, or do we have people leaving on a high, praising and honouring God as they worship? Ego or service, that is the choice all of us make at some time as worship leaders. All of us as musicians and singers grapple with our egos, and if we are honest, most of us want some kind of recognition for our gift. So how do you put that desire aside and just serve? I don’t mean do what you are told, I am talking about genuine servant-hood. Christ calls us to be servants, but if we take a few moments and look honestly at our hearts, while we want to serve there is always a tension with our egos. While ego, ambition and confidence are not all bad, they are often the polar opposite of service. And one of the truest tests of ego or service is going to be how you react when someone else has success. Can you genuinely rejoice with them, can you celebrate their successes, or do you feel resentful or upset when someone else does good? But seek first his kingdom and his righteousness, and all these things will be given to you as well. Therefore do not worry about tomorrow, for tomorrow will worry about itself. Each day has enough trouble of its own. So listen to this podcast and examine your heart, and ask yourself the question about your ministry.. is it about ego or service? Choose worship songs wisely, and you can see powerful worship every time you lead. 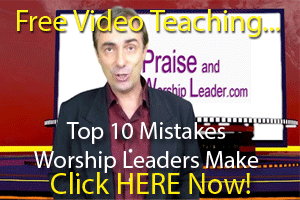 Choose songs poorly, and you will see worship struggle or even flop! Song selection for your church service is all important, and there are a number of criteria to consider when you choose worship songs. When we lead worship we want to see our people worshipping the Lord freely and in power, but to do this we must choose the songs that work. And how do you know which ones will work? Well, that’s the content in today’s very important 12 Minutes for Worship Leaders podcast. Many worship leaders feel confused and even stressed when it comes to selecting the songs for the service they are leading. We do not want to be too progressive, but then we do not want to be seen as old fashioned or regressive either. We might love certain songs, but does that mean that everyone else in the church does too? When leading it is tempting to choose songs that we like, that perhaps we feel comfortable with, but if your congregation doesn’t know them or doesn’t like them, you have a problem on your hands! One of the most common and critical errors I see worship leaders make is choosing the wrong songs, and especially choosing worship songs based on what they like, or what the band likes, or what has just been played at the latest conference you attended. If you do choose your songs unwisely, then there is a massive chance that your worship leading will fall flat. This is why we have a worship academy, to teach these simple but effective principles which will be the difference between leading a few songs and leading your entire congregation into the very presence of God. Trust me, the stakes are high for this one! Multiple Church Services can be incredibly taxing, but they can also create huge blessings for you, your worship team and the whole congregation. Most often we turn to multiple church services because we cannot fit people into a single service, or because we have people who want something different from the service, and we feel it is impossible to join the different needs and cater for them in the single service. In this week’s 12 minutes pod, Erick and Darin discuss the various reasons for going to 2 or more services, the pitfalls, the fallout and the blessings that you might see along the way. And trust me, there are blessings if we do this right, but there can be curses if we do it wrong! So whether your church is growing so well that you need to change the way you do church on a Sunday, or whether you have two fighting factions each of whom demands a church service to their own liking, there are potential blessings and curses along the road. The guys discuss the recent changes they have experienced in church, and how we can see those become a blessing rather than a curse for your people.